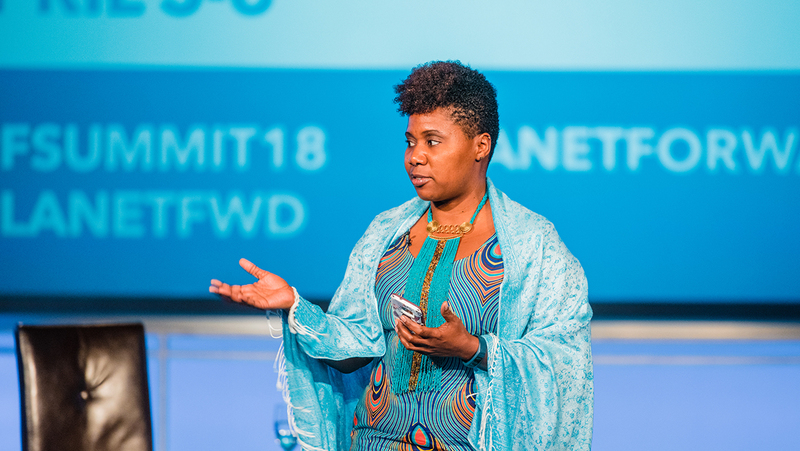 You are here: Home / The 2018 Planet Forward Summit: Thanks for joining us! Frank Sesno and Dr. Thomas Lovejoy talk about the experience we had at Lovejoy's Camp 41 in the Amazon last June - our Storyfest 2017 prize. Dr. Imani M. Cheers, the Summit co-host, introduces the visual journalists from National Geographic for their Eyes on Earth presentation. 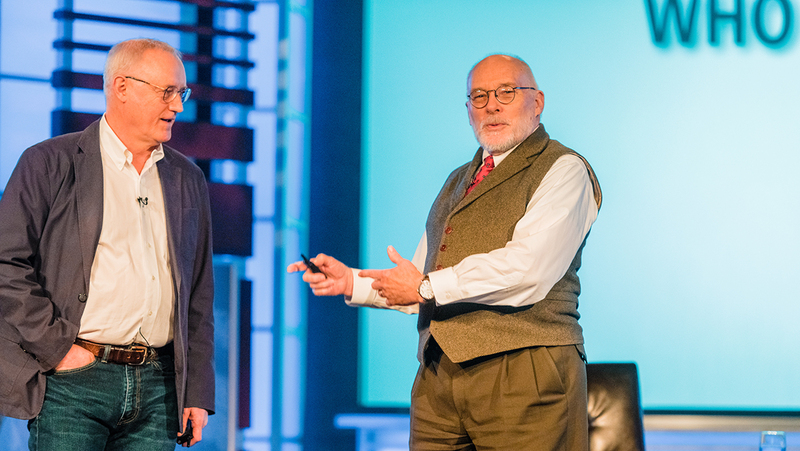 Dennis Dimick, National Geographic Editor Emeritus, and National Geographic photographer Jim Richardson share their project, Eyes on Earth, and its goal of passing the torch to the next generation of visual storytellers. 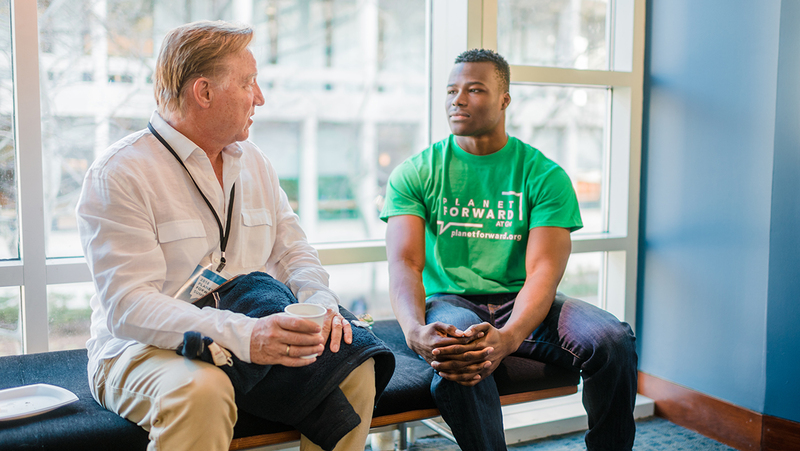 Planet Forward Advisory Board Member and University of Arizona professor Jim Buizer speaks with Eloka Obi, a statistics and environmental studies major at The George Washington University. The two networked at last year's event and were catching up. 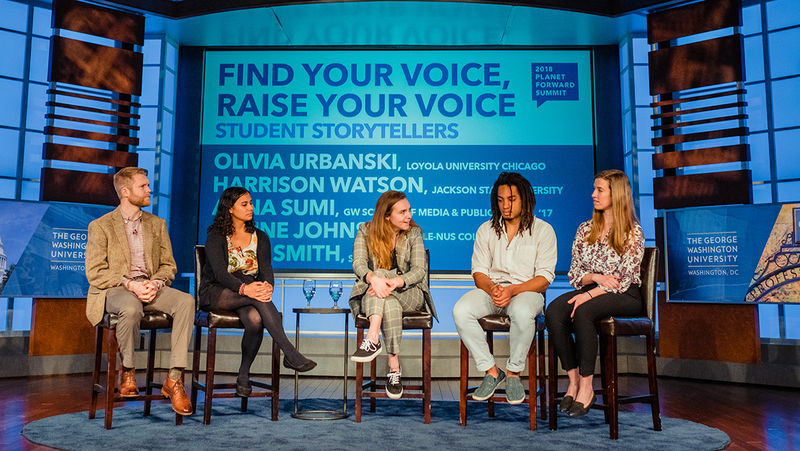 The panel of student storytellers shared stories about finding their voice. From left: Zack Smith, SUNY-ESF '17; Alaine Johnson, Yale-NUS student; Anna Sumi, GWU ’17; Harrison Watson, Jackson State University; and Olivia Urbanski, Loyola University Chicago. Frank Sesno handed over his moderator seat to The Washington Post reporter Chris Mooney, left, and we heard from Beth Stewart, Creative Director at Discovery, Inc.; Chris Policinski, President & CEO of Land O'Lakes, Inc.; Dr. Felecia Nave, Director for Faculty Development & Engagement at Prairie View A&M University; and Paulman Farms owner Roric Paulman. 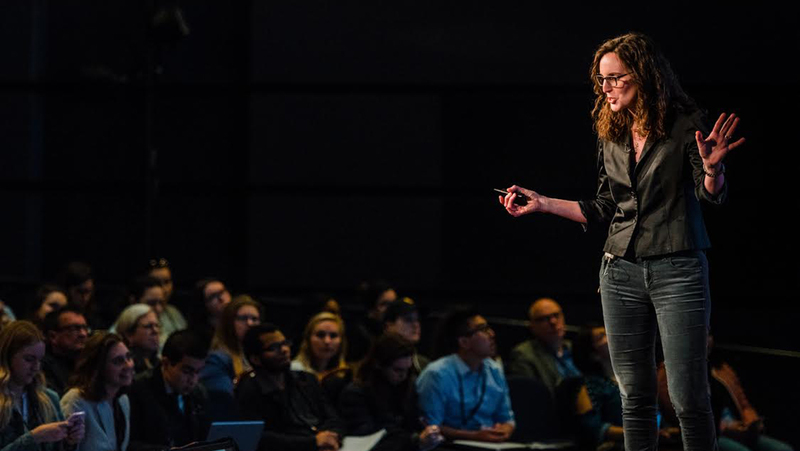 The Climate Editor for The New York Times, Hannah Fairfield, showed some of the new ways we can visualize data and how it can engage wider audiences. 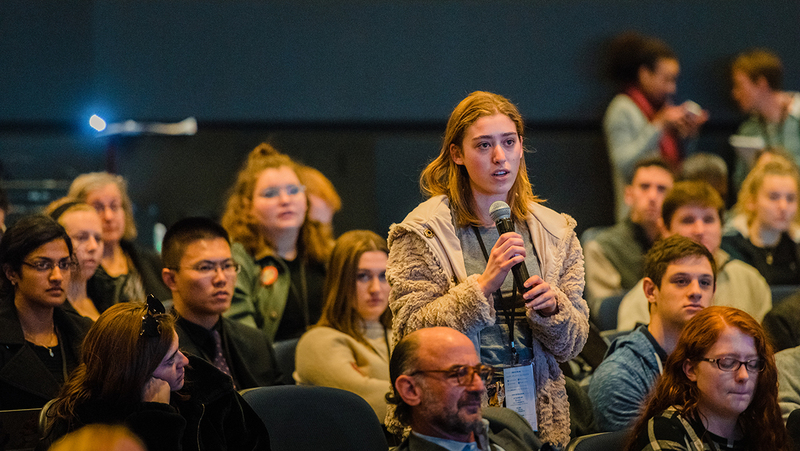 An audience member asks The New York Times Climate Editor, Hannah Fairfield, a question after her presentation. 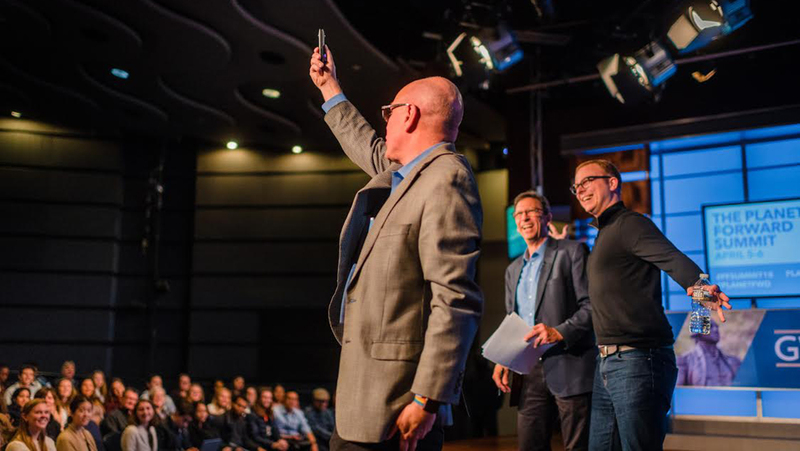 Adobe's Stephen Hart takes a 360-degree photo from the stage with Steve Johnson and Frank Sesno hamming it up. 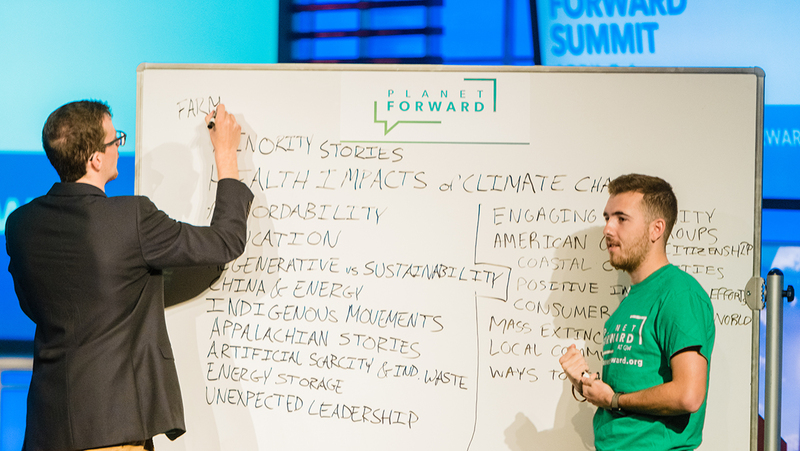 Attendees take a selfie at the Summit in front of the Planet Forward wall. 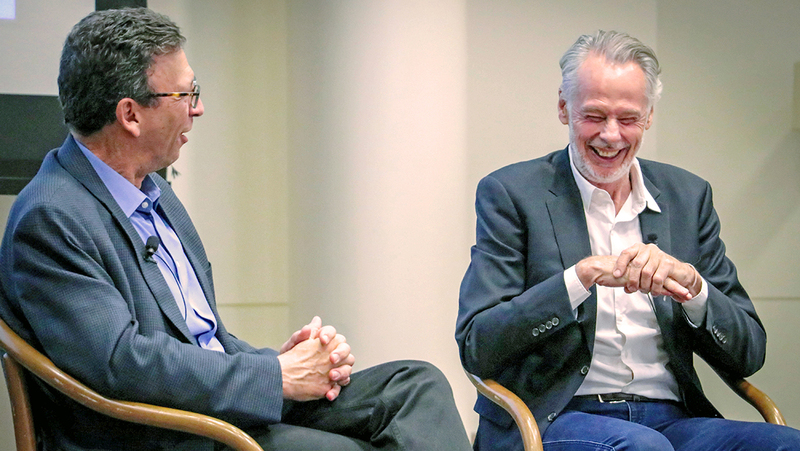 Frank Sesno and Lindblad Expeditions CEO Sven Lindblad share a laugh at the lunch talk on April 5. Thanks to Lindblad for helping us take students to Alaska for the fourth annual Planet Forward Storyfest Award. Breakout session speaker Payton Head and Florida International Student and Planet Forward Correspondent Gillian Daley talk in the hall after the session. 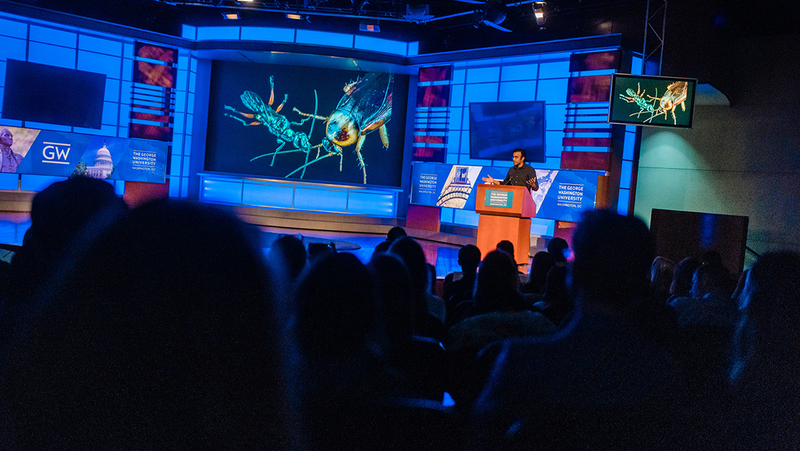 National Geographic's Anand Varma captivated the audience with his storytelling and his astonishing presentation: "Beauty and the Bizarre." 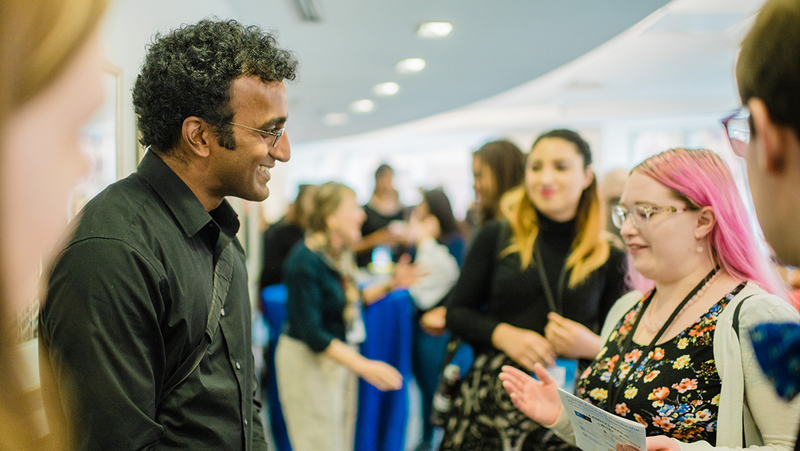 Following his keynote, Anand Varma joined the networking session upstairs. Here, he's speaking with SUNY-ESF student and Storyfest finalist, Janet Rogers. 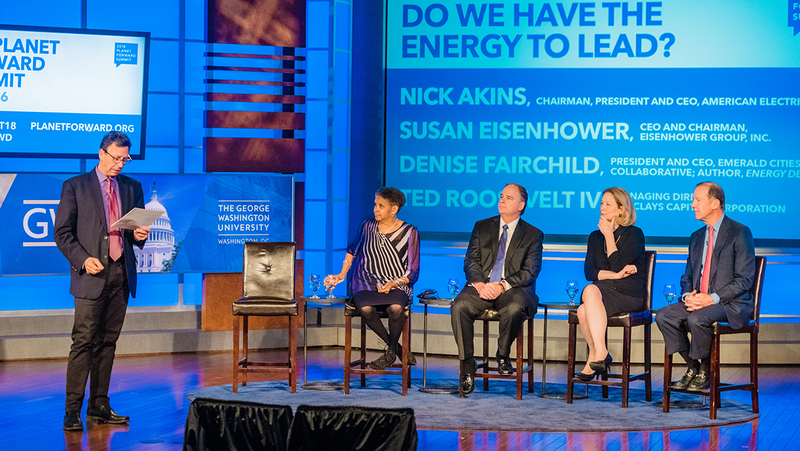 The Planet Forward Town Hall: Do We Have the Energy to Lead, was presented in partnership with C2ES. Speakers included, from left, Denise Fairchild, Nick Akins, Susan Eisenhower, and Ted Roosevelt IV. After the Town Hall, Frank Sesno opened up the floor and broke out the white board for us to record story ideas at the conclusion of the 2018 Summit. The Storyfest winners, plus Frank Sesno, Sven Lindblad and Dr. Imani Cheers, lined the stage after the awards presentation. 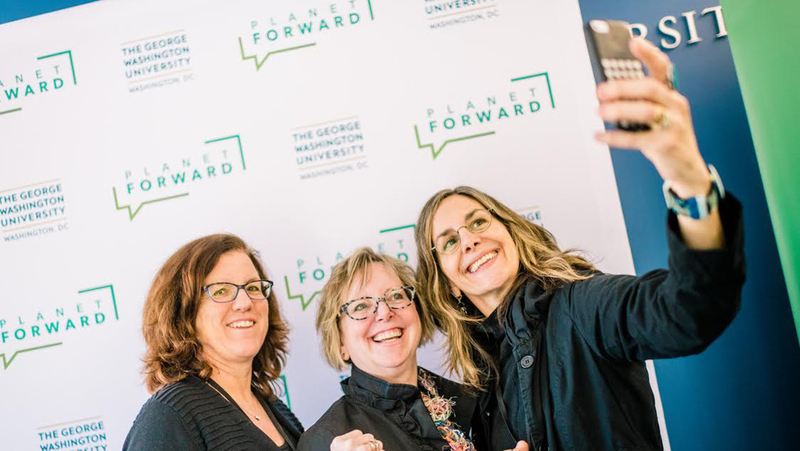 We are still on a high from the 2018 Planet Forward Summit! This year, we had our most successful Summit yet with more than 400 attendees and students from 40 schools around the world! Thousands more watched online. We had special guests from Discovery, Inc., National Geographic, The New York Times, Lindblad Expeditions, The Washington Post, The Center for Climate and Energy Solutions, Land O’Lakes, Inc., World Food Program USA — and more. 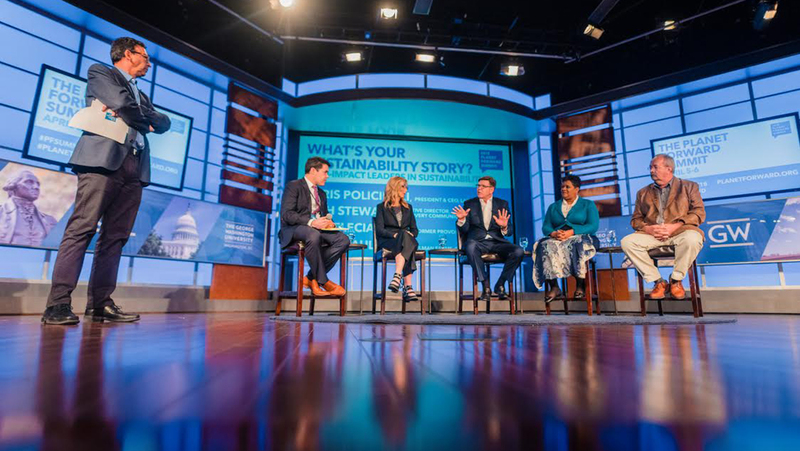 We heard from Theodore Roosevelt IV; Susan Eisenhower; Nick Akins, the chairman, president and CEO of American Electric Power; and Denise Fairchild, president and CEO of the Emerald Cities Collaborative. Our focus throughout: how to understand and convey the stories of our planet and the ideas and innovation needed to move it forward. Our big finale: We announced the 2018 Planet Forward Storyfest award winners — seven student storytellers from five schools. They submitted videos, blogs, photos essays and more capturing incredible ideas and initiatives. They’ll go on an eight-day voyage with Lindblad Expeditions between Sitka and Juneau to capture the stories of climate change while exploring Alaska's coastal wilderness. The 2018 Planet Forward Summit, our fourth annual Storyfest competition, and our second year hosting Planet Forward Correspondents has exceeded all of our expectations. 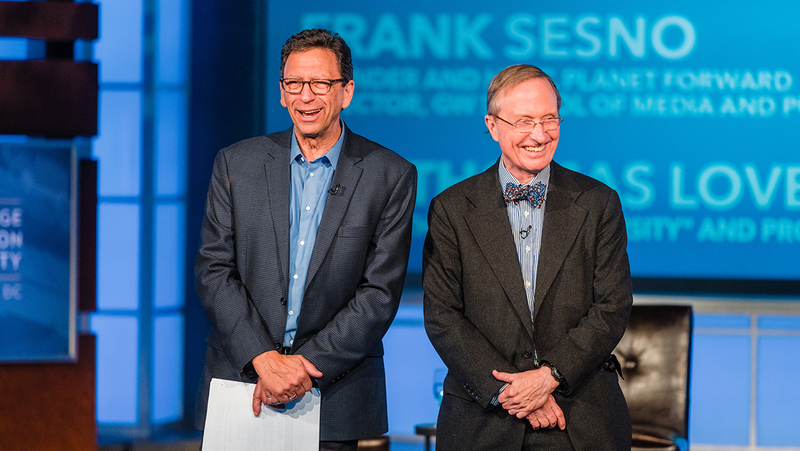 In the coming days we will post the Summit in segments online, along with some of each panel's highlights. 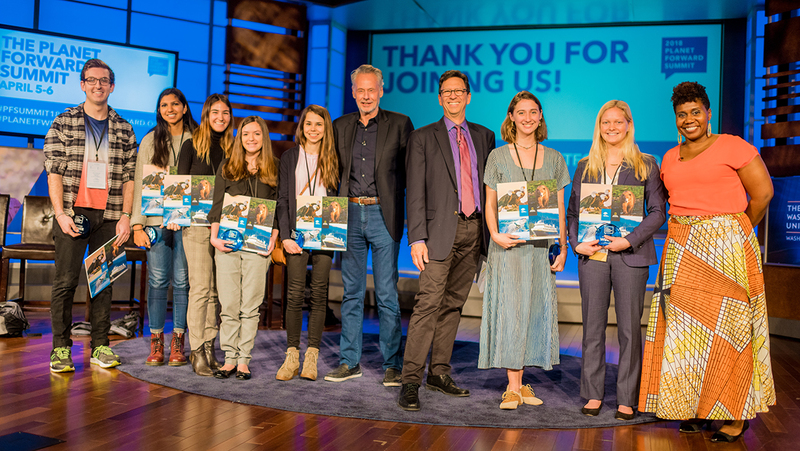 Relive the inspiring presentations — everyone from the incredible visual journalists at Eyes on Earth to the students who have been there — and been inspired to become storytellers, from professional journalists and storytellers to exceptional leaders in sustainability. Were you inspired? Are you ready to join us? We need these stories now, more than ever. Students: If you want to be a correspondent email editor@planetforward.org with your resume. 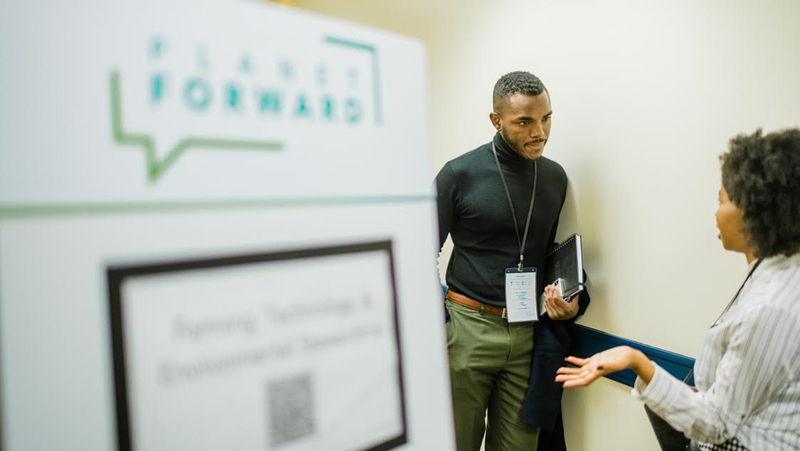 Schools: Interested in joining the Planet Forward Consortium? Reach out to hannah@planetforward.org and we'll get the conversation started on how we can work with you! Huge thanks to our partners and funders: Land O'Lakes, Inc., Lindblad Expeditions, Alaska Airlines, Discovery, Inc., Monsanto, Skanska, World Food Program USA, sweetgreen, UN-FAO, National Geographic, Patagonia, the GW School of Media & Public Affairs, the GW Office of the President, and Mrs. Green's World. To everyone who joined us: Thanks! We do this for you. Check out the stories and adventures online and in our social media: Facebook, Instagram, and Twitter. 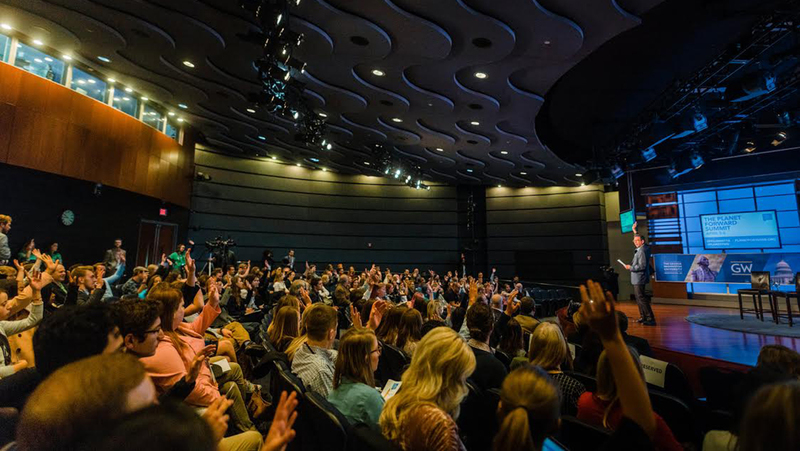 Save the date for next year’s Planet Forward summit: April 4-5, 2019!